While in Beijing, following a 1–6, 6–4, 10–6 second round victory over Flavia Pennetta and Sara Errani with partner Sania Mirza, Martina Hingis sat down with contributor James Pham in a special to SI.com to talk comebacks, prize money, social media and more. BEIJING, CHINA – Novak Djokovic and Serena Williams aren’t the only ones racking up Grand Slam titles this year. Martina Hingis, now in the third reiteration of her career, has won five Grand Slam doubles titles (three mixed with Leander Paes and two women’s with Sania Mirza) and another six tour titles in 2015, earning more than $1.3 million in prize money. “Santina,” their new, crowd-sourced nickname, have practically been unstoppable since first partnering in March of this year, immediately winning their first three outings. Mirza climbed to the No. 1 ranking in doubles for the first time along the way, also adding her maiden doubles Slam title. 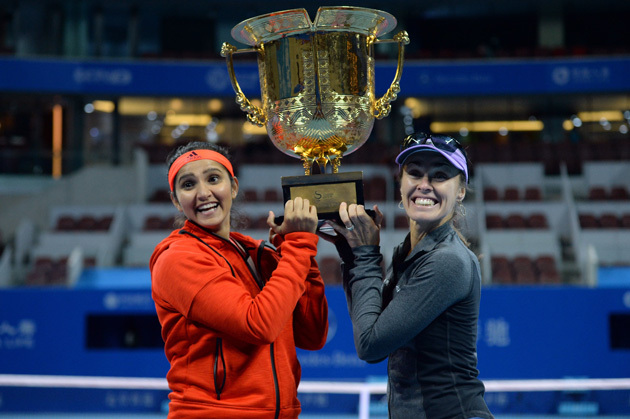 Most recently, the pair claimed the China Open trophy to mark their fourth doubles title in a row. Mirza took some time off after Beijing and Hingis continued playing, partnering with Chinese player Han Xinyun at the Tianjin Open, but lost in the first round. While in Beijing, following a 1–6, 6–4, 10–6 second round victory over Flavia Pennetta and Sara Errani with partner Mirza, Martina Hingis sat down with contributor James Pham in a special to SI.com to talk comebacks, prize money, social media and more. Martina Hingis: Well, there we were playing well! [laughs] When you’re on a winning streak, you have this belief that you’re eventually going to come back and find the winning solution. [In the second round match vs. Pennetta/Errani], Flavia [was] just coming off so much confidence winning the U.S. Open. So it was definitely there already a tough match; it was the semifinals at the U.S. Open [where Hingis/Mirza defeated Pennetta/Errani 6–4, 6–1]. And now we played a first round, well second round, but we had a bye. So we had three, four days off and all of a sudden they played two matches, a singles and a doubles, and we’re like, “Oy!” We had to adjust to that a little bit and we found a way. [laughs] No, no, I wouldn’t say that. Sania is a perfect partner for me right now. They’re [Sania Mirza and Leander Paes] very unique in their styles, but I think because I’m able to adjust to both baseline and the net, on my side I’m very comfortable. They just happen to be Indian both of them, but they’re true champions in their own way. I’m just happy to have such great partners. But it doesn’t just fall from heaven. All that winning comes with some pretty decent prize money. Simone Bolelli told us last week that the money in doubles is a pretty motivating factor. As of this week, you’ve won more money this year than players like Caroline Wozniacki and Victoria Azarenka. He just won a Grand Slam. That’s pretty okay! [laughs] I don’t say “no” to the prize money. That’s definitely changed over the years. I won the same prize money at Miami as when I won Wimbledon back in the day. It’s nice. As a top doubles player, it’s almost like mixing with the top 20 girls in the world. ​People often compare doubles to a marriage. Is that a good analogy? Well, you can see from the past that when things don’t go well off the court, it’s hard to play a good tennis match. So I think it is very important to get along, especially in my case. I mean, today, I wasn’t feeling great, I wasn’t playing well, but Sania’s like: “Hey, might as well play a match. I know we’re not playing [well] but let’s try and find a way, think positive.” Things eventually started happening. I think that’s really important, what I cherish about Sania. She’s a very positive person and those negativities go away. That’s what she’s got. And also with Leander. It’s really important to have this attitude. A lot of the time, it’s to put the other ahead of you, in front of you, when you’re not doing so well and let the other shine. That’s what happens in our case. I have a good day, and she doesn’t have a great day and vice versa. But we’re here for each other and that’s what makes this couple so successful. With how well you were doing in doubles last year and this year, many were wondering whether you were contemplating a singles comeback. I know you’ve said “no”, but was there even a 1% chance you thought about it? Well, I did play [singles in] Fed Cup and I know my true self and that I would have to work a lot harder on the physical part. Obviously, I don’t feel like I can play with a singles player from the baseline. I’m 35 now, so I’m not the new kid on the block anymore. It’s not only this; it’s the recovery also. For the doubles, it’s already there. I feel it sometimes and it would be harder for the singles. That’s why I wouldn’t want to put myself in that position of suffering anymore. Fed Cup pretty much provided me with some answers. I was pretty close. I knew I had the game but not physically. I played a good set against Aga [Radwanska] and had that win kind of going for me against Urszula [Radwanska]. Tennis is a 52-week year pretty much and you have to go week after week. You recover faster when you’re 16, 17 than when you’re 35. I mean, I’ve had my comebacks. I’m happy about that, but I felt like, hey, it’s not going to happen. I’d rather be playing like this, achieving something, having a great life and not having to be at the limits all the time, physically. ​It’s nice. 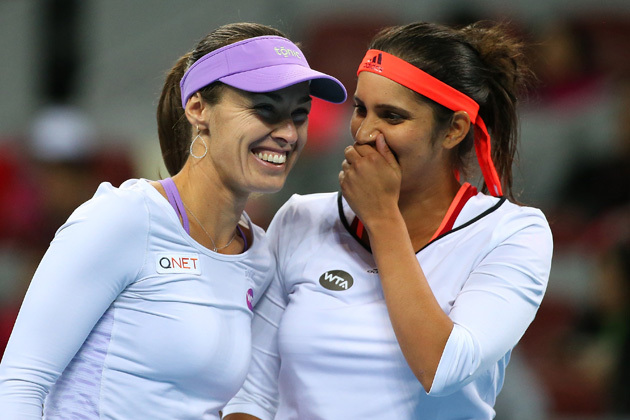 Everywhere we go now, with Sania, she’s got the Indian support all around the world. Even here in China, it’s been amazing. That’s why I’d rather be a challenger in winning Grand Slam titles like this, because who doesn’t like winning? I’d rather win big Slams and tournaments and be the top team in the world than having to struggle to first, second round in singles. I was hoping to have this kind of success but the beginning was a struggle. It wasn’t that easy. You earn the confidence. I still felt like I had the game, but the coaching kind of got me back. With Anastasia Pavlyuchenkova or definitely winning the Miami tournament with Sabine got me back and that changed my priorities. ​Can you compare the satisfaction you get coaching versus playing? I mean, I was very happy for Anastasia [Pavlyuchenkova] when she won the tournament [Estoril, 2013], so that was very fulfilling. If she wins and she gets better, that felt like I was winning, too, because I did my part. She beat Suarez on clay and she played another great match against Azarenka who was number 3 in the world, so I felt like we were going somewhere. That was very fulfilling. [Not as much as] if you win yourself, but under the circumstances, I was very happy with that. I just enjoy being good at whatever you do, try to help other people to get them better and take the best out of them. That’s what my mom said, that it was very fulfilling to be my coach and to achieve something together. As a player, I didn’t enjoy practice. But as a coach I did a lot more because it was like, you do this and this, think about it, when they hit it and connect… I mean the way Anastasia or Sabine can hit the ball, I’m like “wow.” I’ve never been able to hit a ball like that. ​I notice you don’t share a lot on social media. It’s mostly tennis photos. Is that partly because in the past, so much of your private life was made public? That’s exactly what I don’t want to share.